A mountain’s peak is rarely reached by a straight climb. There are many different paths that lead to the top. With perseverance, skill and the will to succeed, great heights await the indomitable individual, regardless of gender, race or creed. 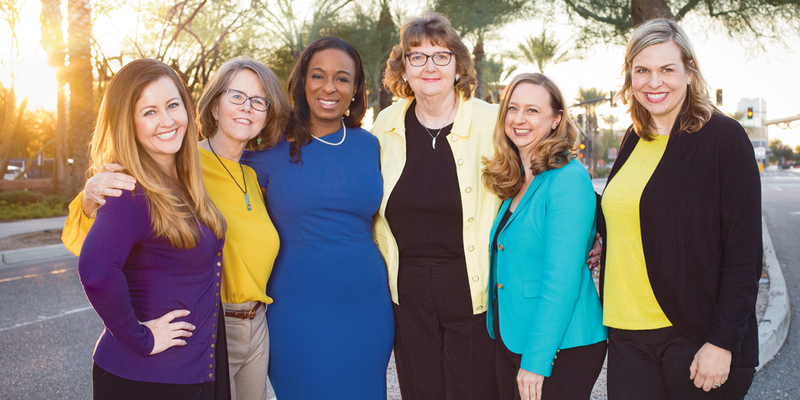 The women leaders of the AAMVA community exemplify that indomitable spirit. Where the path forward was uncharted, they blazed their own trail. And while some are the first to reach that summit in their respective jurisdictions, they all agree they have a responsibility not to be the last. Though each woman’s journey is unique, the common theme is just that: there is no prescriptive career path to success. Ambition is not the key ingredient, but rather, passion. To love the work, and to be the best person for the position—that’s ultimately how the divergent career paths of these women all led to the same place: the pinnacle of the profession. 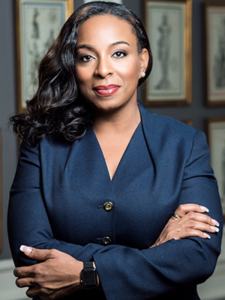 As the first person of color to become director of the Georgia Motor Vehicles Division, Georgia Steele is also one of the youngest directors in the country. She was born and raised in Jamaica, W.I., is a single mother, a graduate of AAMVA’s Leadership Academy and recently completed a doctoral degree in organizational change and leadership from the University of Southern California. From the outset of her career as a New York City 311 call center operator, Director Steele fell in love with public service and helping others. It was during this time that she had her son. Upon return from maternity leave, a member of the NYC 311 leadership team denied her request for some flexibility in her work schedule to spend more time with her newborn. “I was really taken aback. I thought about it. I’m not bound to that one organization. I want to serve and I want to be in public service, but [NYC 311] was not the only agency where I could do that. So I left there to work for the New York City Taxi and Limousine Commission [TLC] and it literally opened up all these doors,” Director Steele says. At the TLC, she found a supportive environment where her leadership qualities were recognized and valued. She received training and was promoted several times, setting her on a path toward her eventual position as Georgia motor vehicles division director. 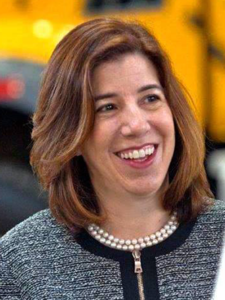 Leslie S. Richards, Secretary of the Pennsylvania Department of Transportation, is the first woman to serve in the role. 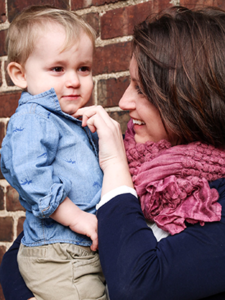 Her journey began at the Environmental Protection Agency, followed by positions in city planning and economic development, then a stint in the private sector prior to an eight-year departure from the workforce to raise her children. She returned to work on a part-time basis with an environmental engineering firm, where she was first exposed to the world of transportation. At the same time, she was heavily involved in her community, serving on the township planning commission. That work compelled her to run for Montgomery County Commissioner. After winning that election, she came to the attention of Tom Wolf, who would eventually become governor of Pennsylvania and appoint her to his cabinet. As a West Point graduate from the first class to include women, Sue Fulton, Chief Administrator of the New Jersey Motor Vehicle Commission, says gender and sexuality have been important issues throughout her career. She spent the next 25 years in brand management at Fortune 500 companies, but maintained her connection with West Point as a mentor to cadets and junior officers. After the election of President Barack Obama, Chief Fulton was involved with the formation of the first West Point LGBT alumni group and became active in efforts to repeal Don’t Ask Don’t Tell as well as the transgender ban. Her work to repeal these military policies raised her profile and that’s how she met Phil Murphy, who would later become governor of New Jersey. When he was filling out his cabinet, he wanted a military veteran and invited Chief Fulton to join his team. 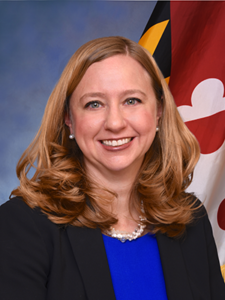 Chrissy Nizer, Administrator of the Maryland Motor Vehicle Administration, comes from a public policy background, working in the state legislature and then the local office of the Department of Homeland Security. One of her main tasks as the Maryland DHS liaison was to bring together many state agencies to coordinate for natural and man-made disasters. One of the men told her on day one he was going to take her job. “In the end, he was no longer there, but I was through hard work, keeping at it and doing the right things,” she says. 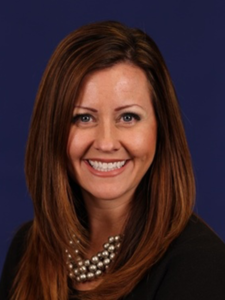 Texas Department of Motor Vehicles Executive Director Whitney Brewster knew as a child she wanted to work in public service. From her early career as a mental health counselor working with at-risk young women, to the Alaska legislature and then the DMV, she has lived that childhood dream every day of her adult life. When she moved from Texas to Alaska, her parents thought she was crazy, she says. They feared they had done something wrong. On the contrary, they had instilled in their daughter the confidence to go anywhere and try anything. When she is approached by women and asked how she managed to achieve her success, it catches her off-guard, she says. “I’ve just been fearless because my mom impressed upon me that you can do anything.” And she has spent her career making that belief a reality. 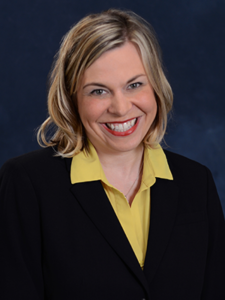 Wisconsin Division of Motor Vehicles Administrator Kristina Boardman, whose parents were both educators, grew up in a household dedicated to public service. After a decade working in the Wisconsin State Assembly, she was drawn to the DMV as a place to “dig in and make a difference” with an agency that serviced everyone. 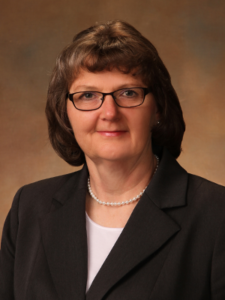 Rhonda Lahm, Director of the Nebraska Department of Motor Vehicles and AAMVA Chair of the Board, became a leader in transportation safety by way of law enforcement. Her first job out of college was at an adult male correctional institution, after which she joined the state patrol and achieved the rank of major. As the first female trooper in west-central Nebraska, Director Lahm confronted gender bias on a routine basis from her fellow troopers and from the general public. “There were officers who, when I was introduced, would not even shake my hand,” she says. But strides have been made since then and no one would be surprised to see a female trooper now, she says. 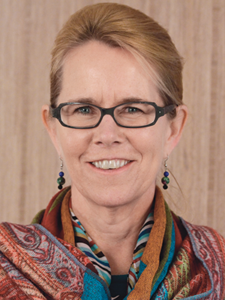 For 35 years, AAMVA President and CEO Anne Ferro has dedicated herself to public service and promoting workplace diversity. 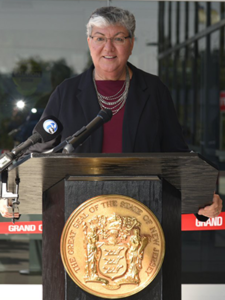 She was the first woman administrator of the Maryland Motor Vehicle Administration, the first woman to lead the Maryland Motor Truck Association, and was appointed by President Obama to a five-year term as Administrator of the U.S. Department of Transportation’s Federal Motor Carrier Safety Administration. 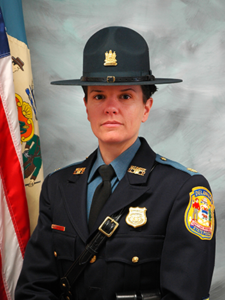 Major Melissa Zebley is a Delaware State Police operations officer who oversees nearly 300 troopers, including the statewide traffic division. She is the first woman in the state’s history to serve in this capacity. Director of the Iowa Motor Vehicle Division Melissa Spiegel began her career with the Federal Emergency Management Agency. 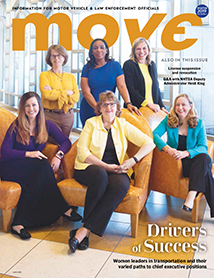 A graduate of AAMVA’s leadership academy, Spiegel joined the Iowa Department of Transportation in 2010 and quickly moved through the ranks to the position of director in 2017. 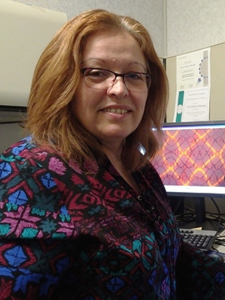 As a senior business analyst with the fraud prevention business integrity office of the Ontario Ministry of Transportation, Laura Barkley-McKeeman is entering her 30th year in public service. She began her career in government through an affirmative action hire to the Ontario Provincial Police as a special constable, and was the only woman in her graduating class from the police academy. While each of these leaders acknowledge the many people who helped them achieve their success—mentors, networks of colleagues, professional organizations and the support of family—they each recognize their responsibility to be the standard-bearers of a new era. “I think it’s imperative to a woman’s success in the workplace to find someone she can bounce ideas off of and talk to when things aren’t so clear, when you haven’t had the experience,” Director Brewster says. She visits the Lyndon B. Johnson School of Public Affairs at the University of Texas regularly to speak with students. “Being able to give whatever I can in terms of information and knowledge as a woman executive, but also hearing their questions and their thoughts, is very energizing,” Director Brewster says.